We had a great start to the week on Sunday with our Community Invasive Species Dig-Up. Another thank you goes out to all of the fantastic volunteers who came out for the event and a special thank you to Nancy, Karen, and Jennifer for supplying some tasty treats! It was a hot day for working outside but together we were able to remove a large portion of the Multiflora Rose and Japanese Knotweed along the Lorne Ave side of the lake. In total, we had 8 large piles the city picked up earlier this week! Continuing into the work week, I have been carrying on the progress made Sunday. There is quite an abundance of the Multiflora Rose on the Lorne Ave side of the lake, so it is expected that this side will take longer than the greenbelt side. A friendly reminder to the residents of the Lorne Ave side to please not dump anything down the bank as it makes my job much more difficult to access the invasive species. I have also been active on the greenbelt side of the lake this week working to fill the empty spots left behind after removal of the invasive species with transplants. I have transplanted some witch hazel as well as a few ferns into these vacant areas with the hopes that they will eventually fill out, providing ground coverage that will aid in the prevention of the growth of invasive species. 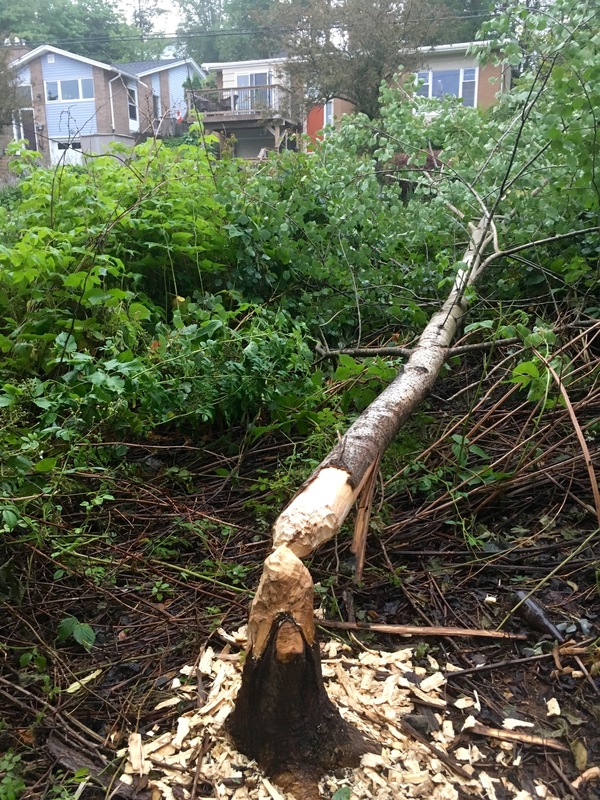 As many of you may have noticed, there was a large tree down on Lorne Ave earlier this week, a result of a hungry beaver! Since then, I have been concentrating more of my time to monitor the beaver activity. I’ve been wrapping the larger trees with wire mesh to limit the damage the beaver can do. Yesterday I was out in the canoe with Beth collecting the water sampling data. With all of the beautiful weather and sunshine we have been receiving we are seeing near surface water temperatures of 24 degrees! I hope everyone enjoys the long weekend! This week I have begun to monitor the beaver activity around the lake more closely. I have done this by marking all of the trees I could access that have been taken down by beavers. In doing so, it should make it easier to identify newly cut trees and changes in beaver activity. 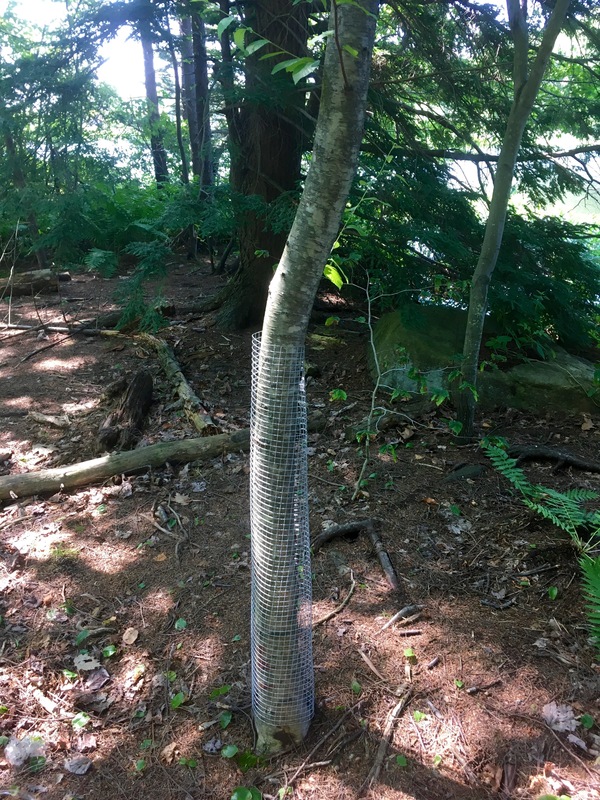 As well, I have continued with the work already started by the OLCS by wrapping the base of larger trees in wire mesh, to prevent the beavers from cutting these ones down. 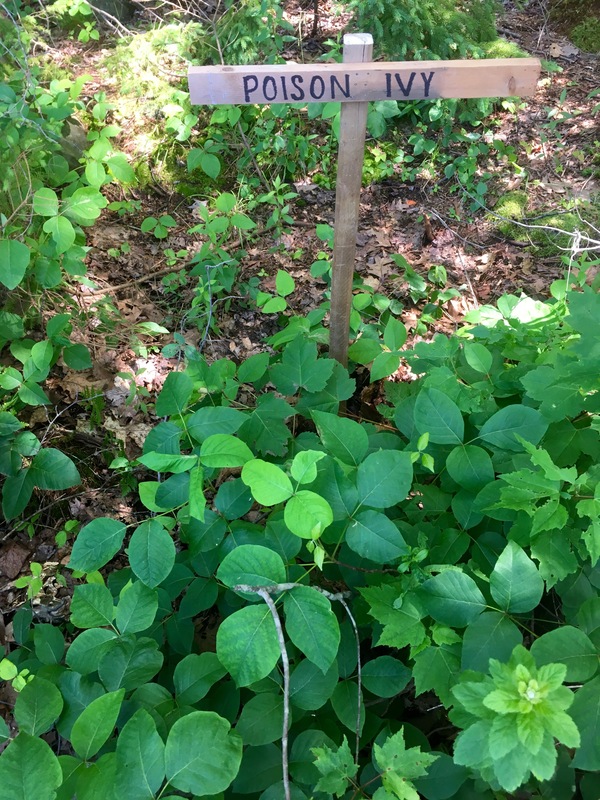 Last week Terry was in contact with the Horticultural Supervisor of Parks and Recreation to discuss the possibility of transplanting native species to areas where I have dug up the Multiflora Rose. This would fill in the unnatural gaps in the vegetation surrounding the lake while also providing ground coverage to prevent the invasive species from returning. We were given a list of plants that would be suitable for this purpose and this week I met with Alexa Kennedy, who is quite familiar with the native species surrounding Oathill Lake. She was able to help me identify the plants on the list suitable for transplanting so I can begin this process. The past few weeks I have been working on preparing a map of the lake highlighting the areas where the different invasive species can be found. This map will hopefully prove to be a useful tool to monitor the growth of these unwanted plants year to year to prevent their spread. The map can be found on the Issues page under Invasive Species. Finally, I have finished up with the invasive species removal on the greenbelt side of the lake. Removal on the Lorne Ave side will begin this weekend with our Community Dig-Up. A reminder that this is on Sunday, July 24th beginning at 10 am. We will be meeting between houses 52 and 62 on Lorne Ave. This is a great way to get society members together and make a positive impact in the community. I’m hoping for a good turn out and looking forward to meeting many of you! This week I have been continuing with the invasive species removal. 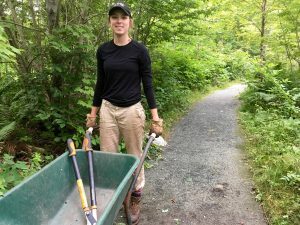 I am currently working on the area near the Cranston path entrance. The piles I have created are getting quite large so the city should be by soon to pick them up. 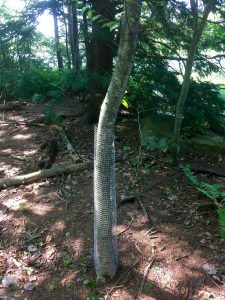 There have been a lot of questions regarding what and why I am digging various plants up so I have made up a brief information sheet on the various invasive species here at Oathill Lake. You can find it posted on the Issues page of the site. I hope this helps! On Wednesday, I finished taking inventory of all the drains in the stormwater catchment area. 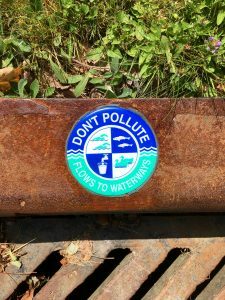 We are hoping to continue to mark these drains so that the community knows not to dump anything down them as they flow directly to the lake. Water sampling was completed with the help of Jim Kennedy on Thursday and will continue to be done on a biweekly basis. I will be looking for a volunteer to help me with the next set so keep an eye out for an email I will be sending out sometime next week. 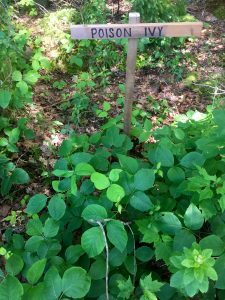 Earlier in the week it was brought to my attention of possible poison ivy near the Oathill Crescent side of the wooden walkway. I have since made 2 signs indicating their location to avoid unwanted contact. Again, if you have any questions or feedback for me I’d love to hear it. Hi Everyone! My name is Emily Piggott and for those of you that do not know, I am working as the Summer Student for the OLCS in partnership with the Youth Conservation Corps at the Clean Foundation. I am a recent graduate of StFX University where I completed my Honours in Chemistry, and will be continuing my education next year at Carleton University with a Masters in Environmental Engineering. I am very excited at this opportunity to become involved in the OLCS as I have grown up in the neighborhood and consider the lake a very special place. Each week I will be posting a short blog to keep everyone updated on my progress. This week, I was trained on the WetPro data collection instrument with Jim and tested all of the sites at the lake. This data was sent out via email to show the impact the AquaGo has had. Additionally, I have started the removal of some of the invasive species around the path area, you may have seen the piles at the Beckfoot entrance and at the other end of the lake. These species include the Multiflora Rose and Himalayan Balsam, both of which are quite aggressive and threatening to the indigenous plants in the area! With this removal, I have also begun to tag the locations these invasive species are found around the lake with a GPS system, which will be used to construct a map. The idea behind the map is that I hope to make it easier to identify and monitor the growth of these invasive species year-to-year and thus better control the unwanted spread. I will be working at and around the lake for the remainder of the summer on many different projects and would love to answer any questions about my work or to just chat about the lake in general, so please feel free to say hi whenever you see me! The entry path from Oathill Crescent to the Oathill Lake trail needs more work. Those readers who walk the trail or fish in the lake will be aware of the significant alterations at the foot of that entry to the trail. The objective of that work was to divert the Oathill Crescent street runoff from its storm sewers, loaded as it often is with road salt and lawn fertilizer, to a settling pond beside the path where some of its contaminants could be absorbed by plant life there. To accomplish this, OLCS, The Parks Department and Halifax Water collaborated on a plan to cut into the last leg of the storm sewer, install a catch pit and build the long narrow pond walkers have noticed, separated from the lake by a berm. That part of the plan is much as expected. After each rainstorm walkers will see that the pond has significant water in it that drains very slowly through the berm into the lake. OLCS members have planted some rushes in it, and plan for many more after some pea gravel is added in the bottom to better hold the plants. 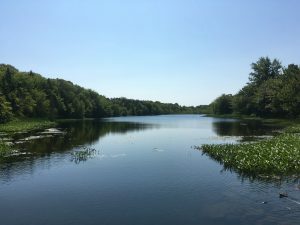 The reeds and cat tails will absorb lawn nutrients and minerals before they enter the lake and will be harvested periodically for disposal away from the lake. An unforeseen consequence of this construction, however, is that the entry path no longer slopes gently to the lake’s edge but instead comes to an abrupt end at a barrier to prevent tumbles onto the riprap retaining the fill at the water’s edge. This change in topography makes it less attractive to swim from there and more annoyingly, to launch canoes and kayaks carried down on cart wheels from there without maneuvering them past rocks on the north side of the barrier. The reason for this topography is straight-forward; it takes significant force to absorb the momentum of the water rushing down the storm drain pipe and divert it to the pond, a force that could tip over the catch pit where the diversion to the pond happens. To prevent this, the original contractor used a large amount of rock backfill between the catch pit and the lake which the core group finds unacceptable because it blocks easy access to the lake. Clearly, in the specifications for the original design, the preservation of easy lake access for swimming and boating was not sufficiently emphasized, so the as-built solution satisfies engineering and hydraulic requirements but not the lake entry point ease requirements. During rain events, the present construction also increases erosion by channeling surface runoff to narrow areas on each side of the structure. Our desired long-term objective is to have a clean, bio-remediated lake that is easy to get into for a swim or a paddle. As an example, one can look at the success of the stairs further along the trail. Given those difficulties, the OLCS core group are considering this challenge as our winter’s work and putting the Lorne Avenue — Beckfoot Drive trail closure project on hold until the problem at Oathill entry point is properly solved. The erosion along the side of the entry path and across the trail below, is forming a delta of gravel in the lake; not kind to bare feet. In addition, it was that overflow from the street that undermined the barrier at the foot of the path. The cause for this, it has been agreed, is that the street grate at the head of the path on Oathill Crescent gets clogged occasionally and may even be too small for the expected flows in heavy rain. Further, the curb between the road and the path should be higher so water in the street cannot overflow down the path. The City has plans to address those problems and to divert any water flowing down the path off to the sides. 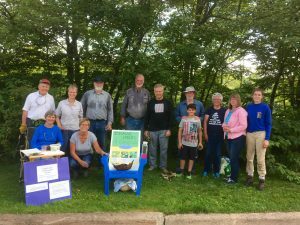 What the core group would like to hear from lake users are suggestions from swimmers, trail walkers and boaters about what they would like to see done at the foot of the path. Readers are reminded, however, that solutions cannot include a dock or a raft and ramp because neither would be supervised during the summer so there are safety concerns and both solutions would have to be removed and stored for the winter months; a formidable task for a few volunteers. Further, no one wants a dock or raft to become a night-time party spot or a focus of contention among sunbathers, dog owners, and boaters all wanting access. We feel it is best to make entry from the trail to the lake easier. Comments welcome.